and marking of surrounding and central islands with SIGNALIGHT white studs. Installing dynamic light marking at a roundabout where several accidents have occurred: straight through tracks, B21 marker flattened, damaged edges, etc. Depending on roundabout visibility and site layout, it may be sufficient to just mark out the central island. If necessary, the islands surrounding the roundabout can also be equipped, as well as approaching lanes with insufficient visibility. The studs installed around the central island are SIGNALIGHT. They operate in synchronised flash mode at night and mark out the roundabout’s bump. The studs installed on the islands are also SIGNALIGHT. They operate in continuous mode (studs continuously on at night) and clearly mark out the edge of the obstacle. Studs installed along approaching lanes (several hundreds of metres before the roundabout) are bidirectional MEGALUX studs. They are useful when there is a complex approach to a roundabout with bends and visibility issues. Their job is to alert drivers and make them slow down. 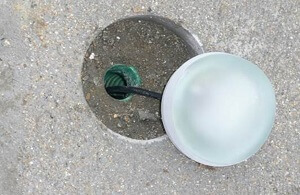 SIGNALIGHT studs installed around the central island operate in synchronised flash mode. 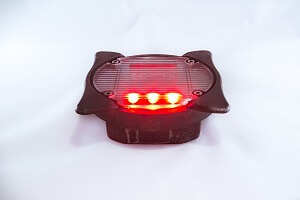 SIGNALIGHT and MEGALUX studs on islands and approaching lanes operate in continuous mode. This makes it easier for drivers to read the road at night, with no risk of them losing sight of the road. The spacing between SIGNALIGHT studs on the roundabout and islands is 3 to 6m depending on the roundabout size. The spacing between MEGALUX studs is 10m on bends and 20- 26m on straights.